El Clasico is the most popular club football match in the world. It has arguably the two most powerful clubs in Europe facing off with a large amount of star players. Technical stars such as Benzema, Modric, Marcelo, Iniesta, and Messi faced off in this match and made it particularly exciting to watch. The two wing-oriented systems met in an interesting way at the Camp Nou. The starting lineups and structures. Madrid defended in what was the usual asymmetrical 4-4-2. The shape looked like a mix between a 4-4-2 and a 4-3-3 where Bale acted as the balancing factor on the right flank as Cristiano lacked any defensive output on the left flank and stayed in the forward line. Isco moved from the left central-midfielder role towards the left flank in order to cover for Cristiano, thereby creating the 4-4-2 shape. The interesting aspect in regards to this structure is that Ronaldo was largely oriented towards the left flank as a forward while Benzema remained central. This meant that Los Blancos overloaded the left side defensively while leaving the right side of the field more open. This is acceptable as it creates many advantageous aspects within the game for Madrid. First of all, overloading the left side means that Barcelona will naturally move away from that side and play into the open side of the field – which was Real Madrid’s right side. This is advantageous for Madrid because it moves the game away from Messi(!) and towards the relatively weaker side that consists of Neymar and Alba. Another nice aspect which arose from the lopsided defensive structure was that the ball was played into spaces where Modric and Bale would be pressing the ball. Bale works hard, is incredibly fast, and is a good presser – so the role suits him quite well. Modric is one of the best players on planet Earth (and had a huge impact on the game) so it’s obviously quite a good strategy for Madrid to force the ball into his area. Along with Madrid’s asymmetrical defensive structure, Ancelotti’s men had another defensive approach specific to Messi which made it difficult for the Argentine to get involved in the game early on. If the ball ever reached Messi, Madrid would press with both the left midfielder and the left central-midfielder to create a sort of sickle shape – similar to how Real Madrid pressed Robben in the 0:4 victory of Bayern Munich last season. Real Madrid closing down the flanks in a similar manner. Marcelo, Isco, and Kroos (with no help from Cristiano) shepherded the area Messi played in together and were able to help stagnate the playmaker’s progression very often. The crowding and deep defense from Real Madrid meant that Messi would cut inside towards midfield instead of cutting inside vs. the opponent fullback. Moving inside against an organized defense and in a less dangerous area meant Messi wasn’t nearly as effective as usual. Messi played as the widest player on the right flank while Rakitic played in the center and made movements to balance wherever Messi went. Dani Alves operated largely in the halfspace in order to provide a more efficient structure in possession and to balance Messi’s very wide positioning. From the touchline Messi would frequently use the synergy of his combinations with Alves and Rakitic to move inside while Alves and Rakitic created space and blocked defenders from Lionel. Once he has moved inside he would use his excellent playmaking skills to play long diagonals towards the opposite flank where Neymar, Alba, or Suarez make back-door runs to penetrate the defense. Or he would dribble diagonally inside and combine with Suarez and Iniesta to penetrate the defense centrally before shooting on goal himself, though these are merely 2 variations of numerous things Messi may do. On the opposite flank Neymar played as the widest player as well. Alba positioned himself more in the halfspace, while making many direct runs rather than participating in tight combinational play like Alves does on the opposite flank. Iniesta played in the center of the field, but he did not balance the movements of Neymar – as it was largely Alba’s role to occupy the left flank. Neymar would use Alba and Iniesta in a similar fashion (for combinations and as blockers) to move inside and create dangerous attacks – though he does this much less efficiently than Lionel Messi. So the main focus of Barcelona was to create from the flanks and then move inside from their to either move directly towards goal or to switch towards the opposite flank to attack. This was made quite difficult because Real Madrid were very compact (horizontally, at least) and controlled the flanks well. The biggest weakness of Real Madrid defensively was that they were very uncompact in terms of vertical compactness. Around the 50th minute of the match Lionel Messi abandoned the right flank (according to Lucho it was Messi’s decision to do so) and moved into the center of the field. This allowed Barcelona to better expose Real Madrid’s weaknesses by targeting the lack of vertical compactness with Messi’s direct dribbling and combinations, and it also meant that Barcelona had more of a central presence – leading to improved counterpressing and more control in regards to the rhythm of the match later in the game. Not to mention the fact that Busquets and Xavi joined central midfield 20 or so minutes after Messi’s position change and Suarez’s second goal – which lead to even more game control. Real Madrid stuck to their usual wing oriented strategy in offense as well. Los Blancos focused largely on combinations on the flanks before looking for long diagonals into the box where they would target their very athletic and dynamic goalscorers: Benzema, Bale, and Cristiano (aka the BBC). Benzema having a more present role in wide combinations. Benzema would frequently move very ball-oriented to support combinations on the flanks while Ronaldo had a free role in the offensive third. Ronaldo would mostly look to move towards the opposite side of the field when Los Blancos looked like they were about to cross the ball into the box. This way he could be in the most advantageous area of the box to attack the long diagonals towards the far post with his incredible athletic ability and good finishing. These roles fit both Benzema and Ronaldo very well as Benzema is much better in tighter areas and Ronaldo excels at attacking crosses. Benzema’s slick backheel assist to Ronaldo. For Real Madrid’s goal Benzema displayed his talents in combination play excellently. Once Modric received the ball Benzema made a diagonal run in order to drag Pique away and open space, and then when Modric played Benzema the ball the Frenchman performed a backheel pass into the space he had just opened for Cristiano to run onto and score from. Backheels in combinations are particularly valuable as defending players anticpate the ball to move in the direction the ball player is facing – so a well-timed backheel completely unbalances defenses during combinations and destroys the opponent dynamics. Thomas Muller is a player which uses backheels very frequently during combinations, some of my personal favorites were his backheel assist to Gotze vs. Roma and his backheel to Robben vs. BVB. Marcelo was particularly influential in the match due to his talent in combination play and dribbling from the flanks. He set up numerous dangerous situations while using his teammates in a similar manner that Messi and Neymar had on the opposite side. Barcelona Defending in a similar fashion to Real Madrid. 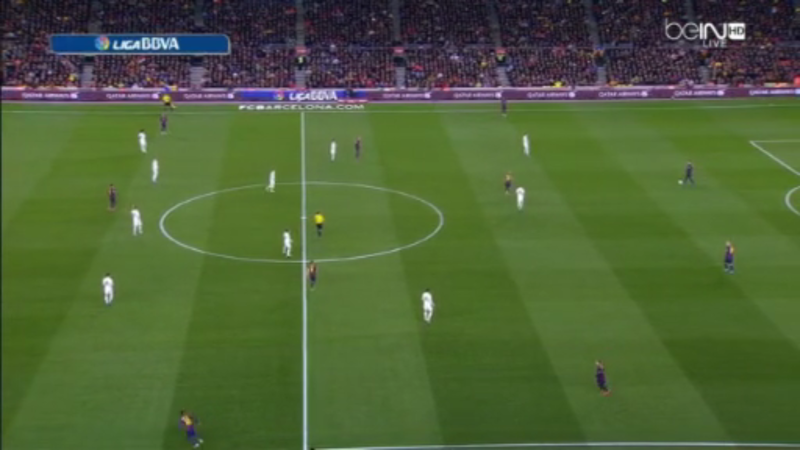 Interestingly enough, Barcelona defended in a 4-4-2/4-3-3 as well. This was because Lionel Messi has a similar defensive work rate to his superstar counterpart, Cristiano Ronaldo. So Lucho took a page out of Ancelotti’s book and used the Argentine as a pass-blocking/guiding forward on defense next to the central forward of the team while the near-side central midfielder covers to flank and the far side winger drops deeper defensively. This allowed Barcelona to be a bit more stable defensively as Neymar and Rakitic were happy to work harder defensively in order to balance Lionel Messi’s workrate. In the end the tie was not as good as the El Clasicos of the past, but it consisted of impressive combination play between superstars of the world game. Messi deciding to do whatever the hell he wants to do eventually sealed the game and allowed Barcelona to dominate the closing stages. This leaves Barcelona with some extra breathing room at the top of La Liga, and they look likely to win the league. Even though it will be tough, they are still in the running for what could be a historic season! Great post match analysis. you’re a true student of the game! Could you please elaborate on the finer points of the transitional play of Luis Enrique’s Barcelona? I’m always apprehensive when I see a lack of effort in pressing, as past experience dictates a Barcelona without the ball is quite a bit more vulnerable than other teams. It seems to me like Lucho has figured out a way to mitigate this vulnerability but that is at the cost of midfield dominance, so i’m unable to wrap my head around how Barcelona would handle a team like Bayern. Barcelona definitely isnt the best team when it comes to defending in shape. Thats why they usually have high-pressing mechanisms and traps even out of their defensive shape to force instability in the opponents possession. In this match, Lionel Messi moving narrower later in the game allowed Barcelona to have a higher amount of players around the ball at the moment of transition so it allowed them to control the rhythm better. The counterpressing isnt as intense as it was with Pep, but that is also due to factors such as different positional structures and strategies! In regards to how they would handle defense vs. Bayern (Pep’s team would likely dominate possession) – they would have a good fit strategically. Bayern attempts to create chances from wide combinations and then moving inside – the way Barcelona defend they focus mostly on the center and leave the flanks open to be isolated – so it’s possible Bayern would end their attacks with many crosses just like vs. Real Madrid last season, though strategies and tactics from both teams can change of course! Then Barcelona would transition through their forwards in Messi, Neymar, and Suarez which is quite dangerous obviously, just as Benzema, Cristiano, and Bale were – but we will have to see how it plays out if they meet each other! Barcelona seemed to miss Busquets from the start. 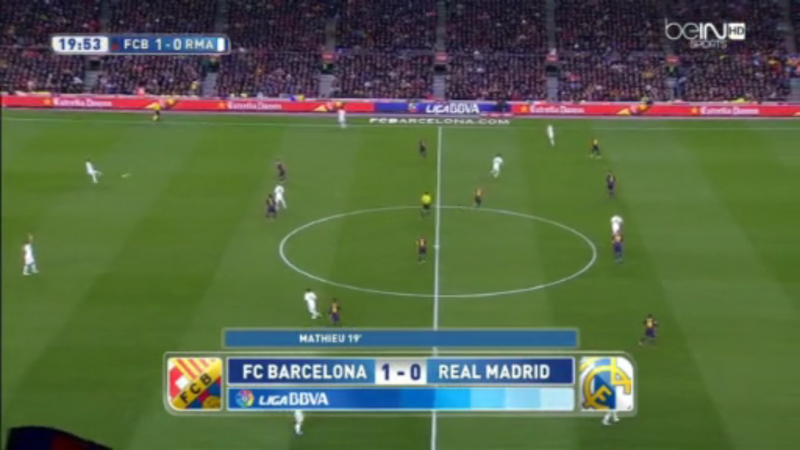 I think in the first half the possession was something like 50-50, for a match at Camp Nou that’s impressive from Real. Modric and Kroos controlled the first half, but Modric still isn’t 100% physically and appeared fatigued at the end. Once he faded and Busquets, Xavi, and Rafinha came on that was it, Barcelona dominated. I think you give Messi way to much credit for this match. He was utterly amazing against Manchester City but weren’t so impressive against Real Madrid. I could get the impression that you’re a FC Barcelona-fan. Besides from that great analysis. I only gave him credit after the 50th minute where he had changed positions – other than that he was contained by Real Madrid very well and he wasnt allowed to do what he normally does against them!